This week Dr. Dan and I are discussing the topic of essential fatty acids, and if they are essential in your day to day diet. Research has shown that the body needs an essential amount of fat in your diet. Restricting fat intake may be unhealthy and fat substitutes can be harmful, such as trans fats. Though saturated fats (animal fats) are often considered bad for you, they are also proven to be essential. Your body will actually make saturated fats if your diet doesn’t contain enough. Fat is one of the three main macro-nutrients, along with carbohydrates, and protein. It is a necessary part of the diet and serves both structural and metabolic functions. Omega-3 fatty acids (EPA & DHA) are important for normal metabolism. These fish oils are beneficial for your cardiovascular health and can help in weight loss. Omega-6 fatty acids are essential fatty acids that play a very important role in heart and brain function, along with normal growth and development. However, too much Omeg-6 and too little Omega-3 may be among the causes for many diseases. 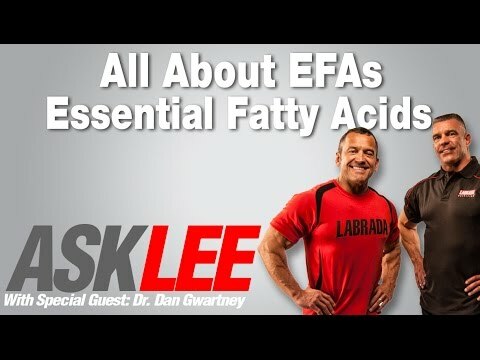 An equal balance of these EFA’s is recommended for most diets. Excellent sources of Omega-3 fatty acids are from fish such as salmon, trout, tuna, mackerel, and sardines. It is recommended to eat 2-3 servings of fish weekly. To get optimal amounts of Omega-3 fatty acids, it is also recommended to take 1-3 grams of EPA and DHA fish oil supplements per day. Good sources of Omega-6 Fatty acids from most vegetable oils, while Omega-9 fatty acids are primary derived from olive oil. For more training tips, visit our website Labrada.com and subscribe to our YouTube channel. I’m Lee Labrada, your lean body coach. Stay lean and stay strong.